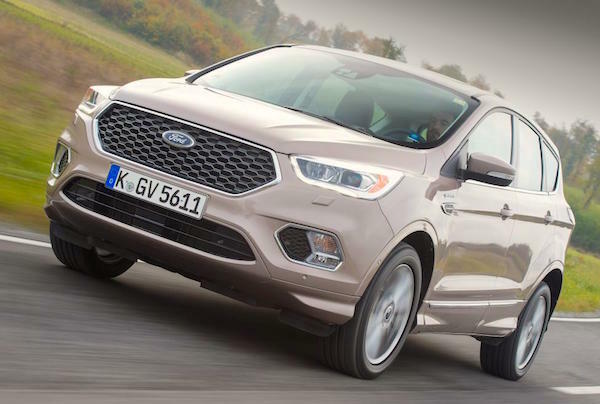 The Ford Kuga ranks 4th in Wales in 2016. Thanks to our partnership with SMMT we can share with you today detailed 2016 sales for Wales. Keep in mind this is a zoom in for each UK nation, these figures are already included in the UK Full Year 2016 Report. The Welsh new car market is down 1.4% year-on-year in 2016 to 91.940 units, accounting for just 3.4% of the overall UK market. The Ford Fiesta remains by far the most popular nameplate in Wales in 2016: despite deliveries down 10%, it sells 2.5 times the amount of the #2, the Ford Focus (-23%). The Vauxhall Corsa also struggles in third place at -30%. Reversely, the Ford Kuga (+6%), VW Golf (+14%), Dacia Sandero (+16%) and Toyota Yaris (+7%) all show strong health inside the Top 10.